How to Enter: We're usually great at celebrating other's attributes or achievements, but God designed each of us as a one of a kind. Maybe you have stellar blue eyes, or an awesome green thumb. Are you a great story-teller? Do you stitch beautiful quilts, or volunteer at the local hospital? Send me an e-mail sharing something special and unique about you. I'll post some of your entries in future updates. 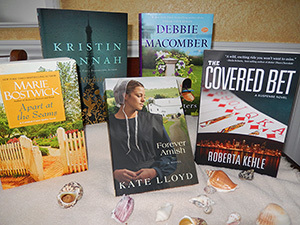 Your summer reading fare includes The Nightingale by Kristin Hannah, Forever Amish, signed by author Kate Lloyd, The Covered Bet, signed by author Roberta Kehle, Love Letters by Debbie Macomber, and Apart at the Seams by Marie Bostwick. 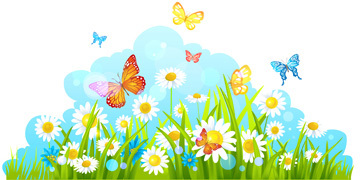 Every year the North American Butterfly Association sponsors several butterfly counts. Visit their website (www.naba.org) and click on 4th of July count. Scroll down the next page and click on count maps to see if one is happening in your area. If not, they include information how you can register to start a count. You can also dig into their details on creating a butterfly garden in your yard. Watch the skies in mid-August when Monarch butterflies begin their 2,000 mile migration south to Mexico for the winter. A few years ago my granddaughter, Charity, and I made this fun cut-out cake for her sister's birthday. It's quick and simple using a 9"x13" cake. 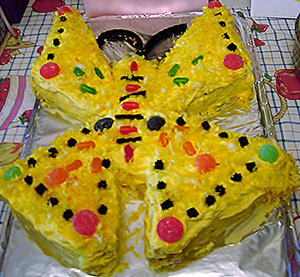 Here's a link www.stnicholascenter.org/pages/cut-cake/ that shows you exactly how to cut the cake to make this lovely butterfly. While on vacation this summer have each family member choose a postcard from places you visit along the road. Have each person address their postcards to themselves, then write their impression of the area, an activity they want to remember, or something special they saw. Perhaps they caught sight of a bear, touched a squishy sea anemone, hiked a trail to a beautiful waterfall, or rode a dune buggy. You get the picture. Before you drive out of town, on your way to your next destination, drop the postcards in the mail. When you arrive home they'll be there waiting for you with all your special vacation memories preserved. As soon as the garden yielded cucumbers, Mom made these delicious chilled slices for dinner. Combine ingredients in a glass bowl and chill several hours in the frig. These add a refreshing touch to dinner on a hot summer evening. It was June, and the world smelled of roses. The sunshine was like powdered gold over the grassy hillside." Kristin - The most encouraging words I've ever received were from my dad. I have four small children and I'm often overwhelmed by life and always tired. Like most moms, I worry that I'm not "good enough". My dad had to have known, somehow, that I was going through a rough mommy time the day he called me and said, "I just wanted you to know that I think you're a great mom, and your kids are lucky to have you". It was just what I needed to hear, and just remembering that conversation helps get me through lots of hard days. Susan - The most encouraging words ever spoken to me were words my then 85 year-old father spoke to me the night my husband passed away. When my late husband died a couple of years ago, I was 4 hours from home. My 4 brothers (with their family) and my parents set up a relay car team to bring me back from the beach (where my husband passed away) to my home. When I finally reached my home after midnight, Daddy was standing in the rain in my driveway that cold, dreary night with his arms stretched out wide, kissed me as I got out of the car, and said, "I'm here for you. I'm not leaving you tonight." He sat up in a chair listening out for me all night, just being my "Dad" and watching over me as I tried to rest. He was 85 at the time. I'm the only girl and have always been a Daddy's girl. He's now 90 and still treats me like his princess. He's still my hero today! Sandy - Encouraging words said to me by my Grandmother.... "You can do anything you set your mind to." Cindy - My daughter has Melanoma. Last fall our community held a fundraiser to help with her expenses. She is a kindergarten teacher and was a single mother of a 6 year old girl at the time. The turnout was awesome, money raised was unbelievable, but when she saw the town's volunteer firemen had parked their fire engine at the corner of the street with a sign that read, "We love Mrs. McLain" she was overwhelmed with love and gratitude. Love, love, love our small town! Ann - In high school my gym teacher told me that I had a beautiful smile and 50 years later I remember that and smile! Another encouragement came from a friend. During a pretty rough time in my marriage she told me, "As long as there's breath, there is hope." She was right...we celebrate our 46th anniversary this year! July 10, (1885) marks the birthday of Mary O'Hara, author of My Friend Flicka. How many of you remember reading her beloved story and dreamed of having your own horse? I know I did. In honor of her birthday, why not reread My Friend Flicka, or corral your kids, grandkids, or best friend and watch the movie, staring Roddy McDowall? You may want to visit a stable and go for a horse ride? 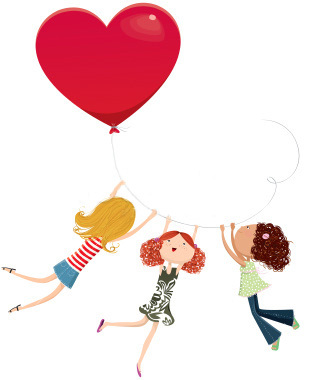 Face the wind, feel the breeze through your hair, laugh, and have fun being a girl again - Dream!